One of the most common unaddressed problems we see here at Breckinridge Park Animal Hospital is dental disease among the adult cats and dogs we treat. By age three, most cats and dogs have some degree of periodontal disease. One reason is that aside from bad breath, there aren’t a lot of signs that your pet is developing dental disease. As a result, dental disease often goes unnoticed and untreated for years and care often comes too late to prevent tooth loss and other serious problems. What Causes Periodontal Disease in Cats and Dogs? Just as with people, periodontal disease in cats and dogs begins when bacteria build up and creates plaque on the teeth. Over time, minerals in the pet’s saliva combine with the bacteria to form dental calculus, more commonly known as tartar. As plaque and tartar spread below the gum line (sub-gingival) they release toxins that compromise the supporting tissue that anchors your pet’s teeth in place. If not treated, this condition can lead to tooth loss. Sub-gingival bacteria stimulate your pet’s immune system, causing it to produce antibody-fighting white blood cells which are designed to destroy the bacteria. But chemicals released by the white blood cells further damage the supporting soft tissue. Ironically, the animal’s own defense system actually worsens the problem. There are two types of periodontal disease in cats and dogs. Gingivitis is the less-severe form of dental disease and causes inflammation and reddening of the gums. Periodontitis destroys the soft tissue and bone beneath the gum line and results in tooth loss. It can also lead to other serious problems. Periodontitis can lead to the formation of a hole that extends from the mouth to the nasal passages. This can cause nasal discharge and fracturing of the weakened jaw bone. Bacteria can enter the animal’s bloodstream and be carried throughout the body where it can harm the liver, heart, kidneys, and other vital organs. 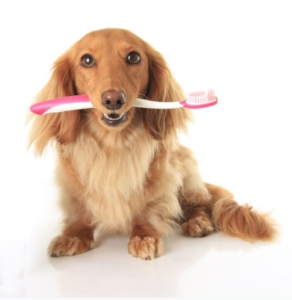 The best way to prevent your pet from developing dental diseases is with routine oral exams and cleanings. If your cat or dog has bad breath, discoloration of the gums, or seems to be having trouble chewing, she may have periodontal disease. Give us a call at 972-690-6900 or click here to schedule a cleaning and exam. If periodontal disease is discovered, the prescribed treatment will depend on several factors including the pet’s overall health and the extent of the damage. In some cases, tooth extractions are the best option. In other cases, saving affected teeth is possible, but this can require multiple appointments and diligent home oral hygiene practices in order to be successful. With routine oral exams and dental cleanings, your pet’s teeth can remain healthy throughout his life. Do you have more questions about periodontal disease in cats and dogs? Give us a call at 972-690-6900 or click here to schedule an appointment today.